A permit to work system is a formal written system used when proposed work is identified as having a high risk, as a result strict controls are required. 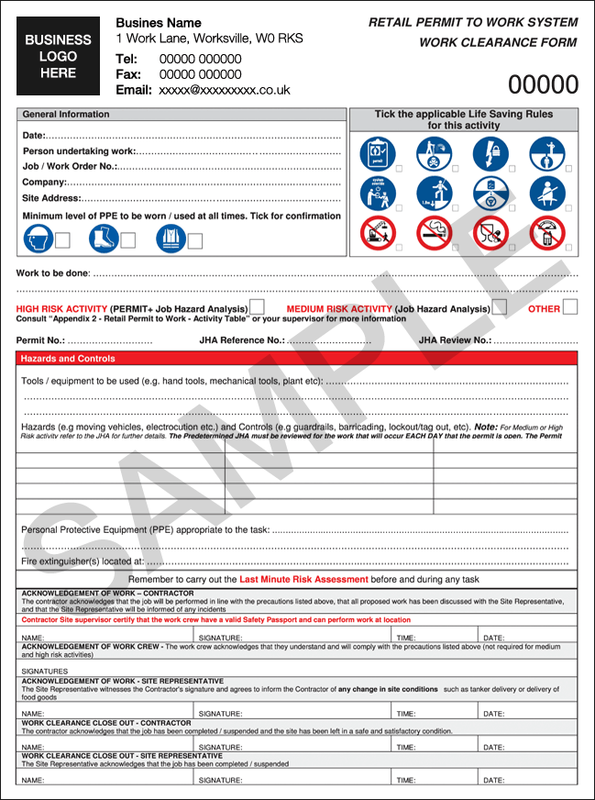 A permit to work form is a document which specifies the work to be done and sets out the precautions required to complete the work safely. We can print custom Permit to Work forms for your organisation. We can use the template on this page, which can be adapted to your requirements or we can design a new form for you which will be tailored to your specific organisational needs. Your company logo, accreditations and company information can all be added to your professionally designed forms. Once written on, the unique properties of NCR paper allow instant copies to be produced. You can choose how many copies are required e.g. 2 part, 3 part or 4 part+ sets are available. Your customised forms can be supplied as NCR Pads, Books or Loose Sets. We are able to pre-print specific fields as required to save repetition each time the form is filled in. For example, your business name, address and so on. We can also add Sequential Numbering, which may be useful when trying to keep a record of your Permit to Work forms. If you would like a quote or require further information, please get in touch.